Avengers vs. X-Men was a Marvel comics event from 2012 written by Brian Michael Bendis, Matt Fraction, Jason Aaron, Ed Brubaker and Jonathan Hickman. The maxi-series spanned 12 issues, with each writer scripting different issues. Having 5 people all working separately on the same book could cause some issues, and sadly that’s what happened here. Let’s get to the plot outline first. The almighty Phoenix is on it’s way to Earth. Its target is Hope Summers, Cyclops’ daughter from the future. Cyclops wants to keep Hope on Earth to harness the Phoenix to restore the mutant population, while Captain America wants to take Hope away to prevent the Phoenix from destroying Earth. That’s about as much plot as you need before the fists start flying and the cloud of stupid that occurs from the fight prevents any character from doing anything smart or rational. 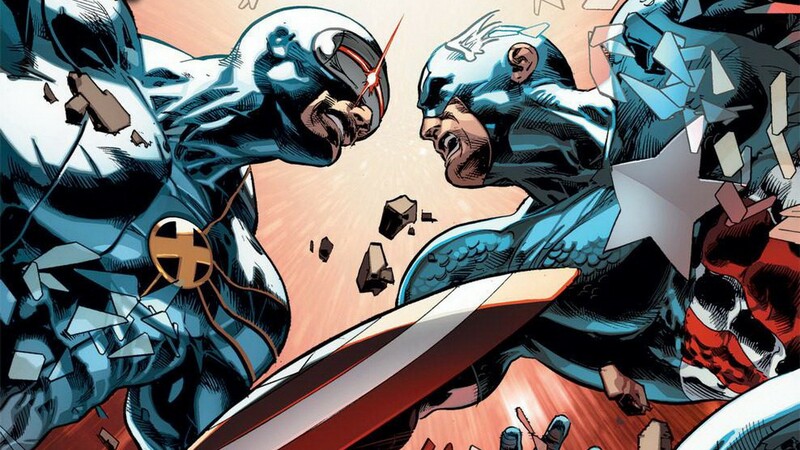 The name “Avengers vs. X-Men” would better be changed to “Cyclops vs. Captain America” as they are the only two characters that the book seems to focus on. Scarlet Witch and Hope are also very important to the story, but I don’t consider them really characters in this book. They’re just plot devices to keep the story going, and the ending with them is telegraphed by the halfway point. While he is one of the only characters, Captain America is heavily out of character, All he cares about by the end is being right and beating down Cyclops. When a tragic attack is carried out by an X-Man, all Cap cares about is that this is now a war, even though people are dying all around him. Even Black Panther calls him out on this (he does the same thing to Tony but about science and magic.) The worst part is how hard they try to make Cyclops the villain, when he is only shown doing bad things after he is attacked or provoked. There’s no ambiguity by the end about who the villain is supposed to be, which shouldn’t happen in one of these superhero fight books. Having the villain be the more likable person, while the designated heroes are all jerks is like a double screw up. There are some good parts in it, the second issue springs to mind. It’s the issue where the fight actually starts and there are some good single fights with pretty funny caption boxes. Spider-Man was also awesome in the book, with his crowning moment appearing in issue 9. The designs of the “Phoenix Five” are pretty good, but the characters themselves don’t really have much of a point. There is also another good fight on the Moon in issue 4. The Phoenix itself seems to have its powers decided at random, where sometimes it is strong enough to keep Wolverine down for a couple hours and then later only for a couple seconds. It keeps him down for a long time when it wasn’t even close to Earth, but can’t keep him down when it’s in its almost purest form. And when one of the Phoenix Five reveals the ability to give legs to whales, he then remembers that whales don’t like land. Final Thoughts: Huh, that got a little weird near the end. The book after this AVX Consequences and the AVX: VS tie ins are actually really good and I’d highly recommend those over this. This book is also really long, with too much padding and predictable foreshadowing.